Each year the World Bank tackles critical development issues in its world development report. For 2016, it chose the topic of ‘digital dividends ’. The researchers concluded that digital technologies have spread rapidly in much of the world, but that the dividends from these technologies—broader socioeconomic benefits—have lagged behind. Their findings apply to the South Pacific as much as any other region. If you put the metrics of the UN’s human development index  alongside the scores of ASPI’s Asia–Pacific cyber maturity report , Pacific island states all end up in the bottom half. 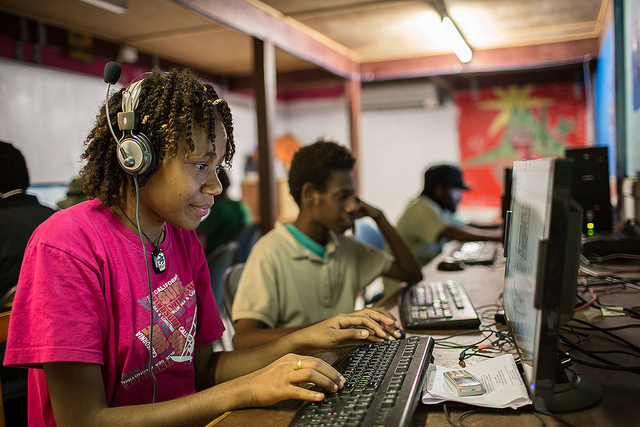 Vanuatu, for example, ranks 134th on the human development index and scores only 34.2 out of 100 in cyber maturity. Other South Pacific countries show similar correlations. It was therefore symbolic that Vanuatu hosted the 9th Asia–Pacific Regional Internet Governance Forum  in August. Under the theme ‘empowering communities in the Asia Pacific to build an affordable, inclusive, open and secure internet’, more than 300 people attended some 35 workshops and heard addresses from Vanuatu’s prime minister, Charlot Salwai; Samoa’s deputy communications minister, Lealailepule Rimoni Aiafi; and the ‘father of the internet’, Vint Cerf. Cerf shared his views as an internet entrepreneur—he’s also Google’s ‘Chief Internet Evangelist’ looking at future tech development and its commercial value—on connectivity in developing regions. The availability of submarine cable connectivity in the Pacific (see a global map of locations, owners and operators here ) is crucial, but establishing a viable business case is even more important. And here some wicked problems confront the countries of the South Pacific: challenging geographic conditions, small consumer bases, limited human resources to sustain modern IT infrastructure, and a social hesitance to embrace ICT-enabled health care, education and services. Stemming from the 2005 World Summit on the Information Society , internet governance forums are held across the globe. They are the place for bottom-up and participatory policy dialogue on internet-related issues, where stakeholders from government, civil society, industry, the technical community and academia come together in a neutral environment. This dialogue model, which relies on reaching a ‘rough consensus’ , has a strong track record in the internet community. It is, for example, the way global internet standards are adopted and IP addresses and domain names are managed. But the dynamics have changed since the 2005 summit. Other actors and entities have stepped in, and opinions on the future of the internet have started diverging. In Vanuatu, Samoa’s deputy communications minister warned of the need to protect local culture, religion and social cohesion in the Pacific islands. He concluded by pleading for vigilant control of the internet and online content by the government, a view shared by a number of countries in Australia’s neighbourhood. In many countries, the internet was introduced by telecommunications companies—often state-owned. Regional cooperation, infrastructure investment and standard-setting among telcos and postal services matured under the auspices of the International Telecommunications Union (ITU) , the UN’s agency for information and communication technologies. The ITU will hold its four-yearly plenipotentiary meeting  in November, at which member states will again discuss proposals for the ITU’s role in governing the internet. These include suggestions that the ITU set benchmarks for cybersecurity, consider introducing a treaty guiding cybersecurity behaviour, and take the lead on international public policy issues relating to the internet. While part of the debate is ideological and based on the belief that the internet shouldn’t be controlled by any one group (including a group of states), another factor is that the network, infrastructure and applications have matured through private initiatives, entrepreneurship, revolutionary research and community-driven collaborative work. For these reasons, many believe the ITU is fundamentally ill-suited  to playing a central role in internet governance. ‘[i]mprove connectivity and access to the Internet across the Indo-Pacific … [encouraging] the use of resilient development-enabling technologies for e‑governance and the digital delivery of services’. While these are lofty goals, voting numbers at the ITU seem be tending towards a state-centric approach favoured by developing and industrialising states, and—as the World Bank report shows—resolving development issues requires more than ICT investment. Deliberations in Vanuatu showed the obvious—and widening—divide between connected and non-connected communities. It will be difficult to bridge that divide when the economic benefits of digitalisation are not evident and when local constituents are hesitant to embrace the digital era. And there’s the geopolitical divide that is reaching a tipping point, between those who believe in a multi-stakeholder, community-driven governance model and those who are pushing for a treaty-based regime driven by a ‘state-first’ approach. Australia and its partners must either brace for a new era of state-centric internet governance where principles of an open, free and secure internet will be frequently dismissed, and where the digital divide will widen, or be prepared to invest more in the human, financial and political capital that will further our international cyber agenda. Bart Hogeveen is an analyst in ASPI’s International Cyber Policy Centre. Image courtesy of the Department of Foreign Affairs and Trade on Flickr.